After my visit to 8 Street at Westfield Garden City “Fresh Food Precinct” and dropping by at Grill n Bao for lunch (we’re regulars now), I was inspired to make my own Gua Bao but with a Filipino twist put into it. This Pork Adobo Bun (Pork Adobo Gua Bao) of mine is the bomb! You have to make it, seriously… it is so easy. ~ In a large deep pan, place your pork belly strips/rashers, garlic, sliced onions, bay leaf, peppercorns, vinegar, soy sauce and water. Stir all the ingredients together making sure that the garlic/onions/bay leaf/peppercorns are fully submerged into the liquid. ~ Turn on your stove to high and bring the ingredients to the boil then let it simmer in medium heat. Place a lid over your pan. Occasionally flip the sides of the pork belly strips/rashers so that both sides of the meat absorbs the simmering sauce. ~ Let it cook slowly for 45mins then sprinkle in your sugar and flip over the pork belly strips a couple of times. As you flip over the meat at the same time slide the pieces on the pan to create that shiny glaze as the sugar melts. At this stage there will be hardly any sauce and the tender pork belly strips/rashers have rendered their own oil. Remove the pan and store the cooked Pork Belly Adobo strips/rashers in a bowl and cover with cling wrap. Set aside. Frozen Gua Bao ~ Prepare your steamer with enough water and bring it to the boil, then lower the heat so that the water will be just simmering, place your steamer rack with your frozen Gua Bao pieces inside. Cover the steamer with its lid and steam the Gua Bao for approximately 5mins. Turn off your stove and leave the Gua Bao inside your steamer while you ready your fillings. ~ Take out your Gua Bao and let it rest on a kitchen paper towel lined plate, so that the moisture from its base can be absorbed by the paper towel. ~ You should have your Gua Bao, Pork Belly Adobo (cut the pork strips into two lengthwise), washed/dried fresh baby spinach leaves and coleslaw. ~ On a clean chopping board or plate position your Gua Bao and lay out 4-6 baby spinach leaves inside. Arrange your 2 slices of the Pork Belly Adobo as the 2nd layer and then top it off with a big generous serve of coleslaw. Serve immediately! You have to serve your Gua Bao (frozen variety) freshly steamed… once it turns cold, the buns will not be as fluffy and soft. Ready-made coleslaw is available at Coles and Woolworths. 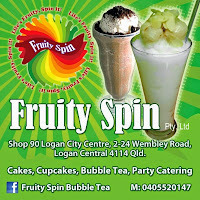 All the ingredients are readily available at Westfield Garden City “Fresh Food Precinct”. This recipe makes 6x Pork Adobo Buns (Pork Adobo Gua Bao). F.Y.I~ This is a sponsored post. Grill n Bao (Ritchie) is fully aware of this homemade Gua Bao inspired version of mine prior to this recipe being posted on Busog! Sarap! Grill n Bao’s “Gua Bao” are made from scratch and the owners have developed their dough recipe to make the buns stay soft and fluffy even when eaten cold. Thank you very much Ritchie for taking the time to talk to me about Grill n Bao.